of Oak Grove Road just off Hwy. 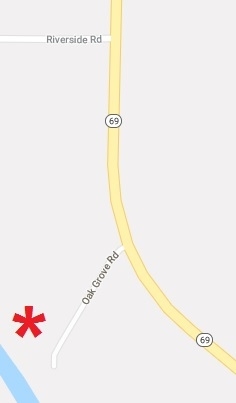 69 in Verona. recommended along with outdoor shoes. drop by just to see the house. with guests Lorlene Pulver and Lyn Elver. Our guests will be Lorlene (Kahl) Pulver and Lyn (Kahl) Elver who both grew up in that house and helped with the operations of their father Vernon’s farm and dairy bottling milk as children. 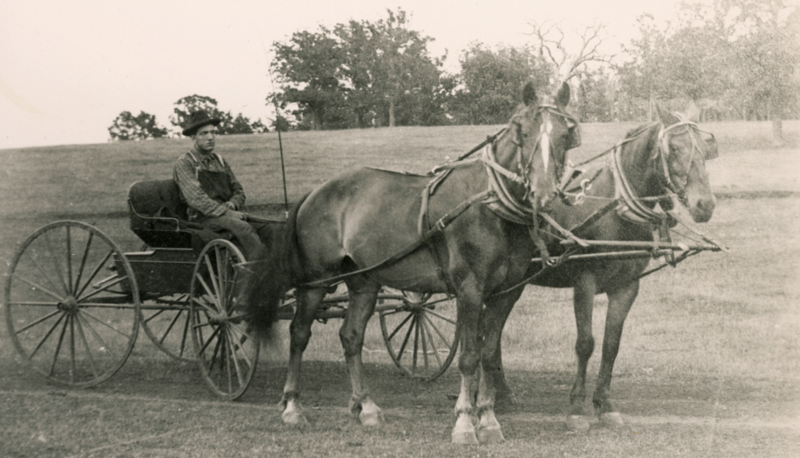 The farm was originally bought by their grandfather Chris Kahl around 1900 and was renamed to the “Maple Drive Dairy” by Vernon in the 1940s. Cows were milked and that milk was delivered by truck to homes in Verona. Lorlene and Lyn will talk about their experiences growing up on the farm, and what the milk business meant for their family and Verona. “Verona’s First High School Hockey Team”, with guest Mary Feldt. Our topic for March will be a look at the origin of Verona High School hockey. Looking at their impressive record of nine conference and seven sectional championships, along with a state title from 2014, it’s amazing to think that hockey at the high school level in Verona all started in the 1980s with one sophomore asking his mom and dad why Verona didn’t have a team. Our guest will be Mary Feldt, who along with her husband Gary played an instrumental role in organizing, managing, and coaching Verona’s first high school hockey teams in the 1980s. After initially receiving resistance from the school against adding another official sport, they took it to the school board where after debate it passed by one vote. Mary and Gary then took it on themselves to get the team going, find other volunteers to help, and kids who wanted to play! They discovered a level of interest in hockey in Verona which started with an original crew of eleven kids that first year. It quickly grew to encompass separate varsity and junior varsity teams in just a few short years. The bonds that the Feldts have formed with those early players can be witnessed at Verona High School hockey games even today – as Mary cheers on many of those players’ children – who now also play for Verona High! Will Schmid and Philip Roethlisberger. 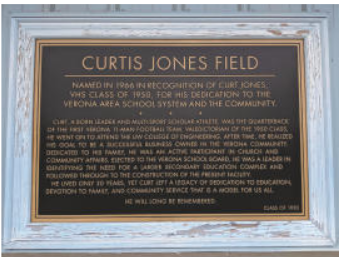 The topic of our meeting this month will be Curtis Jones, a Verona native whose contributions to Verona are still felt by generations of our school children – even over fifty years after his passing. Anyone around Verona in the 1950s will remember him well. But his name will also sound familiar to those who have played in or attended a home Wildcat football game – on Curtis Jones field! We will learn about Curtis from two of his friends – Verona class of 1950 classmates Will Schmid and Philip Roethlisberger. Together they will introduce us to Curtis as a young man – valedictorian, athlete, friend, and son of longtime Verona High School principal A.C. Jones. We will also learn about how as an adult he championed a cause for future generations of Verona students that caused great controversy and in the end was won by his perseverance. It will be an inspiring hometown story worth remembering! Think of all the little items we carry around each day. Keys, coins, buttons, jewelry, maybe a class ring or a medallion. They might not feel like artifacts, but each of these little personal items gives a hint about who we are and what life is like today. The same was true for past generations. And even with the most cherished items, one thing is as true for us as it was for people a century ago: We drop stuff! Our topic this month is a fun hands-on way to learn about our surroundings – and sometimes also a bit of local history – by looking just under the grass. The Four Lakes Metal Detecting Club (FLMDC) was formed in 1982 as the hobby increased in popularity with the advent of smaller, more portable equipment in the 70s and 80s. 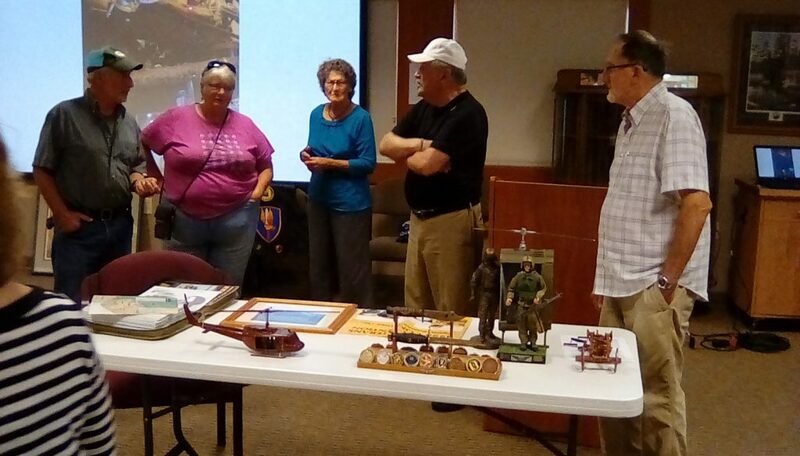 Several of their members will join us to talk about their passion for this hobby, their most interesting finds, and other aspects of detecting that might surprise you. For example, FLMDC members worked with the Wisconsin DNR in an effort to locate and recover two military cannons lost during the Blackhawk War. They also assisted State Archaeologists in searching for artifacts at the “Battle of Wisconsin Heights” skirmish site. Various law enforcement agencies have at times enlisted their help in looking for evidence of crimes and accidents, and in one case they were asked to comb over a prison courtyard looking for buried weapons (in which case one FLMDC member told me “it lit up like a Christmas Tree!”). While our guests most often find more modern objects like pull tabs, coins, and jewelry, they have also come across older objects. Early coinage, square nails, a copper spear tip, a Civil War “GAR” pin, and even a cannonball have been found. You’ve probably noticed the cute “foursquare” style house happily sitting on the corner of East Verona Avenue and Jefferson Street, currently home to “Fiscal Fitness” and “Branded Image”. Newer residents might assume it’s been there quite some time, given this style of home was most popular from 1890 to the 1930s. But to older residents who have lived on Shuman Street it might look a little…familiar. You might not otherwise realize, but it has had two lives! Our guest this November will be Mike Hankard, who saved this house from demolition back in 2003 by doing what could be considered the ultimate “home project”. Mike will describe how he was bitten by the “house moving bug” back in Boulder, Colorado. After being inspired by seeing other old houses moved, he decided to take a swing at it. His first project was a late 1800s brick house that needed a new foundation (and everything else for that matter, as Mike puts it). The project was a success that motivated him to try again then he moved to Verona in 2003 and just so happened to notice a house was about to be demolished on Shuman Street. The following months saw Mike leading a massive project that included designing a foundation at the new location, working with city approvals, doing the actual moving, painting, repairing, and addressing countless aspects of saving this old house. It will be an inspiring talk about the value of keeping and reinvigorating “old” things in creative new ways. facility we know today – and the people who made that happen. Everyone welcome. “In lieu of a formal September meeting, the Verona Area Historical Society will instead be having another volunteer work day on Saturday, September 29 at 10AM at the cemetery next to Gus’ Diner. We are working on restoring the old cemetery formerly used by the Dane County Hospital and Home. Feel free to stop by to help clean up the site, or just come by to say “hi” and find out what the project is all about. So far we have placed 35 of the original headstones back over their correct graves. This is halfway to our goal of reinstalling the 70 that have been found out of the 400 total that were removed and discarded many decades ago. We’ll be back indoors at the Senior center. The idea of being drafted into war seems foreign to the young people of today. But just a couple generations ago in the 1960s it became a reality for many of our nation’s youth, including those from our area. Our guest in August will be Bill Rettenmund, who will talk about what it was like to be drafted as a young man and suddenly find himself transported from a quiet rural life in Belleville, WI to leading a crew on an assault helicopter across the world in Vietnam. Bill has lived in Verona since the 1990’s, having grew up in Black Earth. He was drafted into the army in May of 1965 and trained as a helicopter mechanic and crew chief. Bill landed in Vietnam in February of 1966 as part of the 162nd Assault Helicopter Company “The Vultures”, which belonged to the 11th Aviation Company. 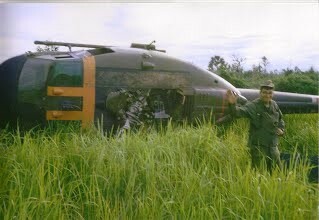 Through January of 1967 he flew air assault and transport missions on a D-model Huey helicopter from a base camp in Phouc Vinh. Bill will talk about surviving two helicopter crashes in Vietnam in 1966, and the injury caused by shrapnel during a mortar attack that led to him receiving a purple heart. He will also discuss the “on the job training” he had to learn on the fly, such as what to do with mechanical failures, strike damage, gun jams, and how he helping his injured door gunner survive using lessons from high school biology. Please join us to learn about Bill’s experience and again renew our admiration and respect for the men and women of our armed forces. Update 6/20/18, update from email 7/13/18. In lieu of a formal July meeting, the Verona Area Historical Society will instead be having a volunteer work day on Saturday, July 14 at 10 am at the cemetery next to Gus’ Diner. We are working on restoring the old cemetery formerly used by the Dane County Hospital and Home. Feel free to stop by to help clean up the site, or just come by to say “hi” and find out what the project is all about. This Saturday, July 14th at 10:00 a.m. is our next volunteer day for our “Bringing Their Stones Home” project at the Dane County Hospital and Home Cemetery (next to Gus’s Diner). If you can manage it, please come help us install a few more headstones and help bring some dignity back to the souls that rest there. We are up to 19 re-installed so far, and would love to get ten more done if we get enough people. Bring work gloves, and any shovels or wheelbarrows if you have extras. Have you ever wondered what lies inside the little farmhouse house with the seasonal wreath at the corner of Hwy M. and PD? Here is your opportunity to find out! This house has quietly sat on this intersection for over 150 years, becoming much more noticeable since the recent Highway M road construction removed most of the surrounding trees. Join us for a field trip and tour of the house given by the current owner. We will be meeting at the farmhouse at the end of Raymond Road at 10am for a quick talk about the house and tour to follow. Please note that Raymond Road no longer connects to PD or highway M as it used to. The best way to access it might be to take Raymond Road south from Verona Road until Raymond ends behind the farmhouse. 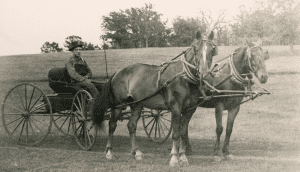 Here are the historical society, we enjoy talking about life back in “the old days”. But how old is “old” – maybe 50, or 100 years? For this month’s meeting we are going to be looking at some snapshots of life in Verona a little fartherback – about 500 million years ago! Verona resident Jim Harrington enjoys the interesting hobby of local fossil hunting. It started a few years back when a casual walk took him past a road construction site near his home. Layers of rock laid down in the prehistoric time when Wisconsin was covered by water stuck out from the newly excavated roadbed. A fan of history, Jim wondered if there might be a fossil or two floating around in there – and he started poking around. That first informal “dig” yielded four Brachiopods (don’t worry – he’ll explain what those are!) Jim was captivated his newly found hobby and an appreciation for the small bits of ancient history each one of us can find around if we know where to look. Jim will be sharing his hobby with our historical society, including samples of the nine different types of Verona fossils he has come across since that first day he became a fossil hunter. Also discussed will be tips for how your and your family can share in this hunt – this will be a good meeting to bring the kids and grand kids! If scheduling allows, we will also have a fossil expert present from the UW Geology Museum to talk even more about local fossils, and answer all of your fossil and geology-related questions.